Now as a warm blooded Iowan, I couldn’t pass up posting a lil’ something about my hometown to help fellow tourists and residents alike. I have plenty of space on this blog to talk about myself but this page is dedicated to Lake View. Please also note that some information here may be outdated so feel free to get in touch with updated information. Lake View, Black Hawk Lake and surrounding areas offer a great deal of variety in terms of recreational and historic interests. Whether it be enjoying water related activities, trail hiking & biking or various other activities and attractions, there is something for everyone in Lake View. Black Hawk Lake, a 957 acre lake under the jurisdiction of the Iowa Department of Natural Resources, is the southern-most glacial lake in the United States.The lake and surrounding areas offer a wide variety of activities, from camping, boating, fishing, hunting, wildlife viewing, swimming and many winter activities. Black Hawk Lake hosts around 320,000 visitors annually. BLACK HAWK STATE PARK – Black Hawk State Park includes many park lands, campgrounds, trails, game preserves, historic structures, and the waters of Black Hawk Lake. ICE HOUSE POINT: Named for the area of Black Hawk Lake from which ice was harvested in yesteryear, Ice House Point is a DNR park located on the south side of the Town Bay. Ice House Point is a popular destination for fishing and includes a handicap accessible fishing pier. Built by the Civil Conservation Corp (CCC) during the Great Depression and completely restored in 1999, these historic Stone Piers offer an excellent access to the waters of Black Hawk Lake for fishing, bird watching, or just relaxing. PIER TO PIER WALKWAY: In 2004, a six foot wide concrete walkway was installed connecting the two historic Stone Piers. Engraved cobblestones placed at the north Stone Pier as memorials and honorarium to friends and family helped to finance the walkway. Since this trail is near the shore of Black Hawk Lake, it affords an opportunity to enjoy the beauty of the lake and surround scenery. 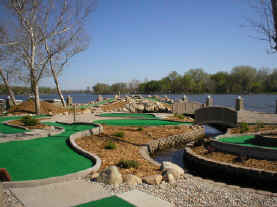 Boulder Beach is a 19-hole mini-golf course located next to Crescent Beach, along the shores of Black Hawk Lake. The course uses a natural landscaping theme utilizing trees, bushes, flowers, rocks and water hazards as the obstacles. Green fees are $ 4.00 for adults; $ 2.00 for children 5 – 12; and children under five are free. o CAMP CRESCENT: Camp Crescent is a full service campground located on the town bay. With 250 spaces, many served with water, sewer and electric hook-ups, Camp Crescent offers a friendly atmosphere, with many shade trees and large open spaces. A cabin that sleeps 4 is also available for rent. Cabin: $40.00/night (2 night minimum) Persons renting the cabin are required to post a security deposit equal to one night’s rental fee which is returned if the cabin is found to be clean and in good shape. 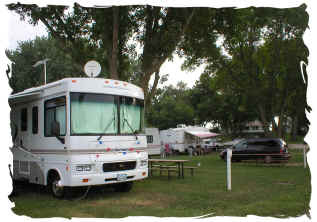 o 30-ACRES CAMPGROUND: 30 Acres Campground is operated by the Iowa Department of Natural Resources. Located on the south side of Black Hawk Lake, 30-Acres offers a natural, secluded, serene setting for a weekend outing or an extended camping adventure. A cabin that sleeps 10 is also available for rent. BOATING: A favorite water activity on Black Hawk Lake is boating. Whether you’ve the need for speed or a penchant for paddling, you’ll find runabouts, deck boats, pontoons, fishing boats, wave runners, sail boats, catamarans, kayaks, canoes, and paddle boats sharing the water. Boat ramps providing access to the water can be found at 30 Acres, Ice House Point, Marina on the North Shore and next to Crescent Beach in Town Bay. Arrowhead Lake allows electric trolling motors only. FISHING: Early mornings on Black Hawk Lake finds people casting lines to hook walleye, crappies, bullheads, catfish, bass and bluegill. In August a Carp Fishing Contest draws anglers for a weekend of competition. State fishing licenses and bait can be purchased at various locations around town. Favorite fishing spots in Town Bay area include north and west Stone Piers and the floating handicap accessible dock on the north area of Ice House Point. HUNTING: A popular fall and winter sport in the Lake View and Black Hawk Lake area is hunting waterfowl, deer, cottontail rabbit and pheasant. Check for hunting season dates and license information. WILDLIFE: Beautiful eagles, waterfowl, swans and pelicans can be seen from Town Bay, Cottonwood Point and Provost Slough in the Black Hawk Lake area and in the Hallet Pits area south of Lake View. Eagles can be seen from November until the ice melts in the spring. The eagles sit in the trees at Ice House Point and can be seen from the Inlet Bridge most mornings during ice melt. Pelicans can be seen at Provost Slough or Cottonwood Point. Other waterfowl can be seen anywhere in the area. o CRESCENT BEACH: Adjacent to Camp Crescent, Crescent Beach offers public swimming, beach volleyball and playground equipment during the summer months. During the afternoons, Crescent Beach is staffed with certified lifeguards. o 30-ACRES BEACH: A swimming beach is located on the east side of the 30-Acres campground. This unsupervised beach is available for campers and the public. o DENISON BEACH: Denison Beach is a DNR park site with a swimming area, a recently-restored stone shelter house originally built during the Great Depression by the CCC, and large open spaces which are great for large gatherings or a small family outing. The shelter house can be reserved by calling the DNR at (712) 657-2638. WINTER FUN: When Black Hawk Lake freezes over, the winter activities begin. Choose from ice-skating, ice fishing, snowmobiling, cross-country skiing and snowshoeing. Occasionally, iceboats are spotted. Depending on ice conditions, the Arctic Open Golf Tournament is staged in February on or near Black Hawk Lake. ARROWHEAD LAKE: South of Lake View are several abandoned gravel pits which have been transformed into park lands. The largest of these pits is Arrowhead Lake. These pits offer excellent fishing. Boats with electric trolling motors only are allowed on Arrowhead Lake. Arrowhead is a popular spot for ice fishing during the winter. 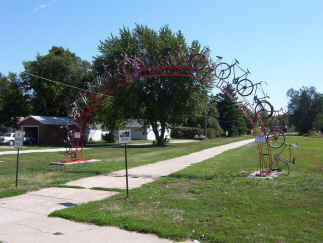 SAUK RAIL TRAIL: A joint effort of the Sac and Carroll County Conservation Boards, the Sauk Rail Trail is a 33-mile trail running between Black Hawk Lake and Swan Lake in Carroll. This heavily used multi-purpose recreational trail provides a quality outdoor recreational experience for the public, while preserving varied habitat for game and non-game wildlife and preserving Iowa’s native vegetation. STUB SEVERSON TRAIL: This self-guided nature trail is dedicated in memory of Bernard “Stubb” Severson. 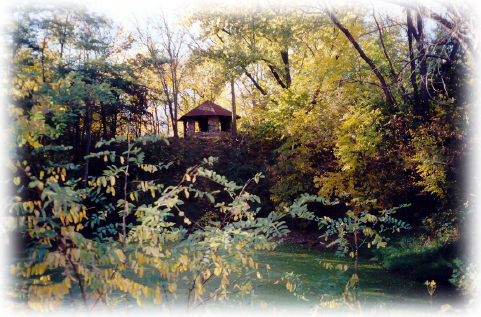 The trial winds through the Black Hawk Game Preserve, and is used to access the Witches Tower, a stone shelter built by the CCC during the Depression, on the highest point overlooking the Black Hawk Lake area. A nine hole, par 34 course located in Sac City. (712) 662-7342. CHIEF BLACK HAWK STATUE: A statue of the great Sac Indian, Chief Black Hawk was sculpted in 1934 by Harry Stinson, a participant in the “CWA Arts program under the direction of Grant Wood.” This eleven foot tall statue sits on the north edge of Camp Crescent where he looks over the lake that bears his name. The statue was completely restored in 1999. SPEAKER PARK: This two acre park overlooks Black Hawk Lake. 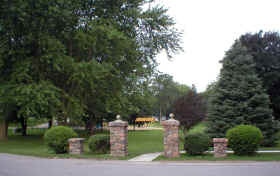 The park features modern playground equipment, basketball court, ample open space, and two shelter houses This is the site of many family reunions and other gatherings year-round. The Centennial Shelter House is a heated and cooled, enclosed structure that can be used year-round. Reservations are required and range from $30-50 depending on the day of the week and amount of the structure to be reserved. For more information and/or to make reservations call (712) 657-2634. HISTORICAL MUSEUM AND LOG CABIN: Built in 1996, the Lake View Historical Museum offers a glimpse of Lake View’s history. One unique display in the museum is 130 species of birds which have been stuffed and mounted. Another distinctive feature is the log cabin which was built around 1870. The Museum is located at 114 Crescent Park Drive and is open weekends from Memorial Day through Labor Day from 2-4 PM. GUN SHOT HILL: This 15 acre park is located on the south side of Black Hawk Lake. The rolling hills make Gun Shot Hill a popular picnicking site. 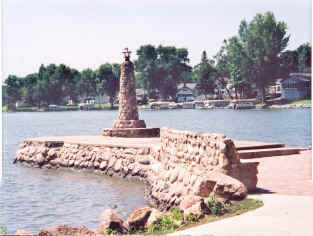 It is adjacent to the inlet to Black Hawk Lake which is a popular fishing area. Sac County boasts many other attractions and land marks including several county parks dedicated to the conservation of Iowa’s natural beauty. Lake View boasts of a number of eating establishments that offer a wide variety of dinning experiences. From quaint cafés to authentic drive inn’s to fine dinning. Glacier Bay Bar & Grille located at 111 Boulders Dr. is now open. JerZees is located on Hwy 71/175, between Lake St. and Third St. serving dinner Wednesday through Sunday offering a full menu or Piccadilly pizza. Kathy’s Korner is located at Main and Third Street serving breakfast, lunch & dinner 7 days a week offering a variety of hot and cold sandwiches, tacos, pizza, broasted chicken, desserts & ice cream. Outlaw’s Drive Inn is an authentic drive inn located at the corner of Lake St. and Hwy 71/175. Open seasonally from Memorial Day to Labor Day offering a variety of sandwiches, sundaes, cones and blizzards. Lake View and the surrounding Sac County area have a unique selection of stores for your shopping enjoyment. Of course, we have all the basics from a grocery store, lumber yard, hardware store and a furniture store, but we also offer several gift and variety stores where you can find antiques, gifts, collectibles, souvenirs and home décor. Prairie Pedlar, a unique gift and dried flower shop is located in a Sears Roebuck barn north of Odebolt. Several gift, flower and antique shops can be found in Sac City. In addition to 2 campgrounds, there are several other options for overnight lodging. Lake View Motel & Suites is a nine unit motel located on Highway 71/175. They have recently added 4 new suites with kitchenettes. Reservations can be made by calling (712) 657-2140, 657-2438 or 657-2345. Boulders Inn & Suites at Black Hawk Lake – a newly constructed 32 unit hotel. For more information, call 877-650-2660, 712-657-2660 or go online to www.bouldersinnlakeview.com. Eastern Shore Lake Homes is located on the southeast shore of Black Hawk Lake in Lake View, IA, there are seven fully furnished lake front condos; 4 are two bedroom and 3 are one bedroom, they have a large sand recreation area and a boat dock. For more information visit www.easternshorelakehomes.com or phone (712) 657-2019. Lakewood Park Cabin is a two bedroom furnished lakefront cabin with a screened porch and private dock. Amenities included. For rates and availability call 515-288-9993. Marie’s Bed and Breakfast is located on Sixth Street in a brick ranch-style home. This B&B offers two bedrooms. Call Marie at (712) 657-2486 for details or reservations. Lake View is conveniently located in west central Iowa along Highways 71 and 175. The closest commercial airports are located in Fort Dodge, Sioux City, Omaha and Des Moines. Carroll and Sac City airports can accommodate single and twin engine aircraft only.